A-level students should be paid for passing exams in science and maths, a report recommends. Action is needed to stop the fall in numbers studying those subjects, says the report for the Council for Industry and Higher Education. Since 2002, there has been a 15% fall in the numbers taking maths at A-level in England, while those taking physics fell 14% and computer sciences 47%. Ministers agree the UK needs more science and maths graduates. The report, published by the Council for Industry and Higher Education and IT consultancy LogicaCMG, warns that businesses in the UK will face a shortage of qualified employees within the next few years unless government funding is found for the development of "Stem" subjects: science, technology, engineering, mathematics. As well as offering financial incentives, there should be extra training for teachers because it was only through inspired teaching that pupils would be encouraged to continue with such subjects. The report said that pupils were forced to specialise too early in their school careers, often limiting their options. 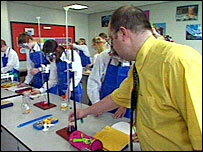 LogicaCMG's Dr Martin Read said a payment of about £500 might be enough to encourage students to stick with Stem subjects. Richard Brown, the chief executive of the Council for Industry and Higher Education said: "The future lies in knowledge-intensive businesses: pharmaceuticals, IT, financial services, manufacturing. "The problem is that some students see the IT and science curriculum as dull. We need to inspire them with the roles they can take on after school and university and demonstrate what they will be able to achieve with a background in these important subjects." He said the report showed that Stem subjects were still seen as very stereotypical, with girls making up only 15% of engineering and technology subjects. "We need to do more to change the attitude of a generation." While the numbers studying science and maths at A-level has fallen, there has been an increase in the numbers applying to study such subjects at university. There was a 12% increase in applications for physics places for this year, and a 10% increase for maths. The report's authors say it is vital to bring on the next generation of Stem graduates. Education Secretary Alan Johnson welcomed the report, saying:" The UK is a thriving economy and our capacity to innovate and excel in science and technology is vital to our global competitiveness. "To remain this way our young people need to qualify at the highest levels in Stem subjects."